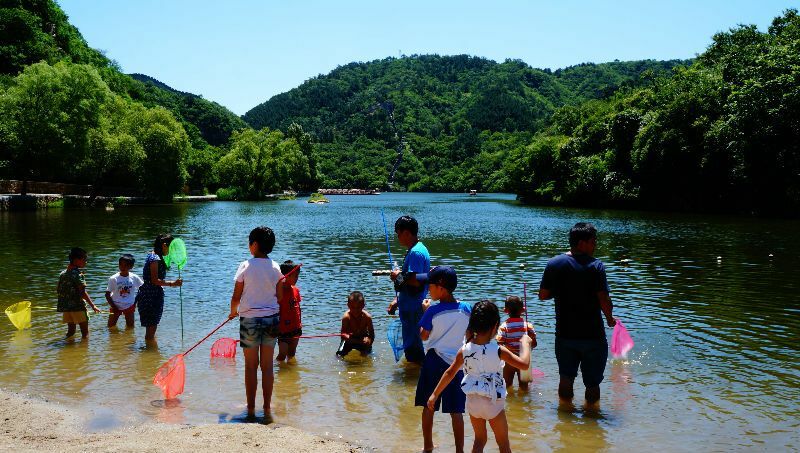 For those looking to visit an alternative section of the Great Wall of China accessible from Beijijng, I bring you today all the information you’ll need to spend a day visiting Huanghuacheng! This section is still a bit of a “secret” but it’s truly stunning, it has submerged bits, a wee beach, it’s not crowded and you can get there by public transport. CHINA. 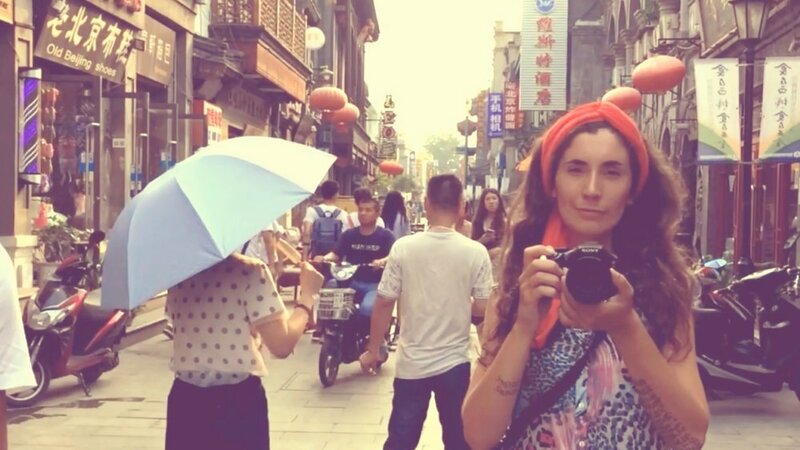 So familiar to this Buenos Aires-born girl with an eclectic Chinese neighbourhood in town. A school friend nicknamed "The Chinese", and a mandatory Sunday family lunch at the --guess what?-- Chinese Restaurant by the park. I didn't realize how Chinese culture influenced my whole life till we landed in Beijing. 5 days submerged in a "lovely sauna weather" of 38-Celsius degrees at 9 am. With a jet lag that made me think I was turning into a bear AND a chipmunk, all at the same time; never felt like such a rockstar, attending photographic requests from the locals and being massively shared in Whatsapp. Life is sweet and I LOVE CHINA. But, the challenges weren’t the heat, the fame or the Jetlag. It was deciding which section of the Great Wall we should visit. I was very motivated with going to Front Jiankou but then Diego came up with the “Lakeside Great Wall”, aka Huanghuacheng section. Have to confess I was a bit afraid of Front Jiankou because… have you seen the photos??? It’s amazing but at this point, we were too tired and it was so hot that I was afraid of falling of exhaustion while climbing this wild section of the wall. It’s very well known among backpackers and apparently, the Lakeside section is not very famous. It took us a lot of effort to gather some information about it. This is all to say that we were not willing to pay a fortune for a day trip. Also didn’t want to go to the most famous and crowded sections: Badaling and Mutianyu. After the dam was built in 1974 some of the walls ended up under water, giving it a very special feature that you can’t find elsewhere. 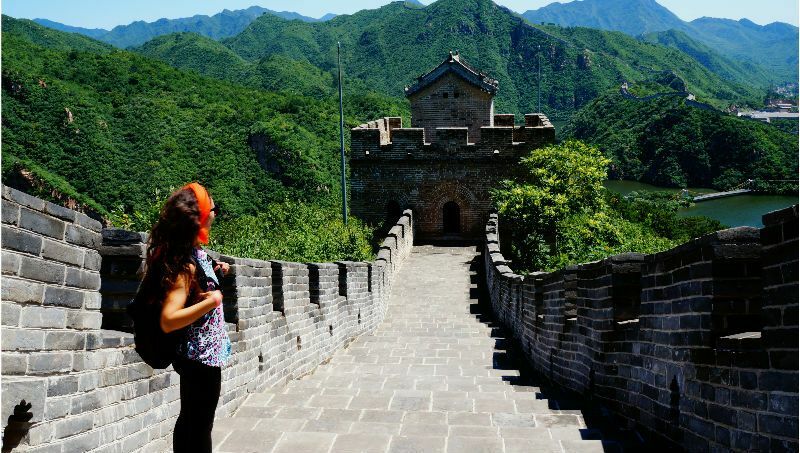 Stop asking yourself "how to get to the Great Wall of China". 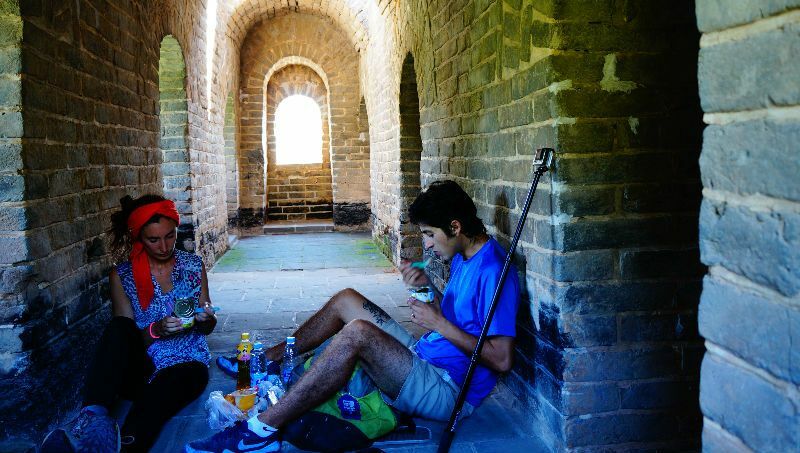 This is easy and in 1,5/2 hours from Beijing, you'll see this cool section. I’ll explain it below in detail. There are a wild section, a restored section and a third that’s being restored right now. We even got to see some men working on it! I know this is hard to believe because as I told you, it’s a pretty sweet spot. I guess that because Huanghuacheng was closed to the public for years and it’s kind of far, maybe not so many people go there. We came across only two groups of tourists. We were alone most of the time --and even had a picnic in one of the towers!--. If there’s a beach… that’s my kind of place, so nothing else to say. The Qin and Ming dynasty were the main builders of the wall. The construction originally started in the 3BC and finished during the 17AC. Many different dynasties worked on it, with the goal of making a protective fortification. Idea was to defend China from the invaders coming from the north. Millions and millions worked and died building the wall. I encourage you to learn more about this before you go. It's useful to have a deeper understanding of this unique man-made structure. It was supposed to be 8800 km. But it’s not! An intensive study carried by the “State Administration of Cultural Heritage” determined that the length is 21,196km. This is including natural barriers and parts that have almost disappeared and from which only the foundations remain. The Huanghuacheng section belongs to the Ming Dynasty. 188 years were necessary to build it! Badaling, Mutianyu, Simatai (most famous), Jinshanling, Front Jiankou, Huanghuacheng y Juyongguan. 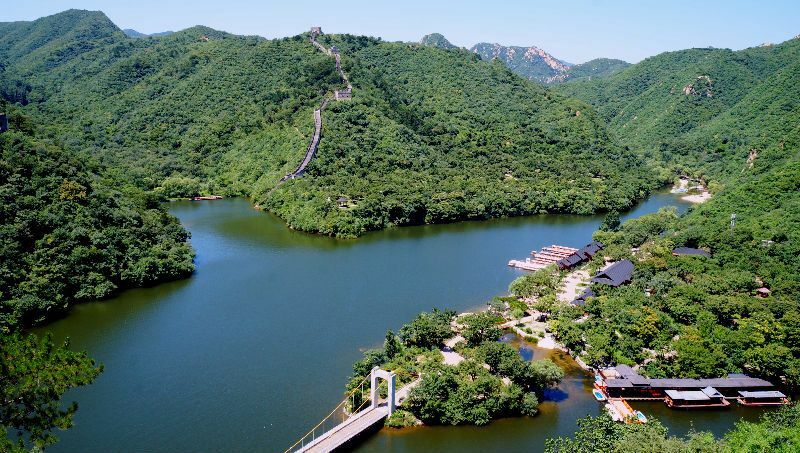 Huanghuacheng is also known as “Lakeside Great Wall”. In Chinese: 黄花城 Huánghuāchéng /hwung-hwaa-chnng/ 'Yellow Flower City'. I recommend you to keep some notes of places in Chinese characters during your visit, it will make your life easier! Before I keep going, I may just say that getting around Beijing is easy. Way easier than London. And I’m talking out of my own experience. We were using the metro quite often and didn’t take one single taxi. We stayed in Sanlitun neighbourhood that is close to the Dongzhimen station, and about 8km from Tiananmen Square. Go to Dongzhimen bus station (东直门枢纽). This is the main station, from here you can also take the train to the airport. You can get here by metro, lines 2 & 13. Once in Donzhimen, you will take the bus 916 or 916 Express (916 快). You will find some signs with arrows guiding you to the bus stops. You will see the people in line and the signs with the bus numbers. The frequency is 10-15 minutes. Return to Donzhimen: 916 is from 4:55 to 19. 916 Express 4:50 to 20hs. We caught the 916 Express at 6 am. We were confused about how to buy our tickets. The bus driver got upset and we were just there saying “ticket, ticket” jajajaj it was pretty funny. Then this sweet sweet boy, maybe named Look, helped us by getting our tickets, then we sat together and he took heaps of photos that sent to all his family and friends. So, you can buy the ticket on the bus. You pay cash, and you will put your money in a box that’s next to the bus door. You can also get a Smart Card. We didn't but maybe you want to check it out! So approximately one hour later you will get off the bus in Huairou Bus Station (怀柔汽车站). From where you get off, walk about 100 meters. After the lights of the avenue, you will find the bus stop where you will take the local bus number H21 (colour blue). It’s a 40 minutes or so drive. Again, you buy the ticket to the person selling it on the bus. The H21 will leave you 300 metres from the Wall. You will see a sign pointing in the right direction. And you will walk through this cute small village. There are some food shops and a small supermarket. As this is still not a very touristic section, you won’t have to wait or pay exorbitant prices. To come back you will do the exact opposite. You will take the bus in the same parking spot where you got off. Go to Donzhimen – Take the 916 or 916 Express – Get off at Huariou Bus Station – Take the H21 local bus – get off and walk 300metres =GREAT WALL OF CHINA. You will pay cash. Some places accept credit cards but is most likely you end up using paper. We ended up getting the simple ticket. Which I’d say is best because the fun part is to see the landscape from the heights and the boat trip is mostly scenic. Is still beautiful though! I wanted to get the boat ticket but it was not possible to understand each other with the lovely girl at the counter. We both tried using google translate, but it kept giving results such as: “Do you want to come to the building in this boat”. But, easy, that people are very kind and helpful. Great wall hours f operation: This section is open to the public year round. From 8:30 to 17. From November to March closing time is at 16:30. You won’t get a map for your visit. In front of where you got your tickets, there’s a big sign explaining in English and Chinese a little bit of the things you can do. Just to be clear! I’m not talking about the wild unrestored section here. You can see it from here though but is not open to the public. People still do it as is not dangerous, but we couldn’t find how to get there. For what I read you access to locals farms that will ask you for a small commission. As I was telling you at the beginning, we couldn’t really find a lot of information so we thought it was possible to access the wild section from here. Life is good. Until you start walking. And then you are just melting under 45 degrees temperature and climbing steps that are higher than your knees. But, come on! This is the Great Wall of China! Show some respect! You will walk around the lake and get to the tiny beach. Then cross the Chesnut Garden that was planted by Ming soldiers. There you can start going up up up, there are different ways to start hiking up, there are plenty of signs. We walked until there’s no more wall. Then we came back down and crossed a bridge. Here you can see the section that goes under the water. We walked up again the section that is being restored right now. In a way, I felt I was witnessing history being made. Like I’m here and these guys are rebuilding the biggest man-made structure of all times. We walked for about 3.5 hours. The hike is absolutely safe, just bring water and a hat (or a ridiculous red pashmina that I thought made me look good, but nope). Overall, it was a really simple but cool way of doing the wall, and I highly recommend it to everyone. Actually, I FORBID YOU TO GO SOMEWHERE ELSE, at least till everyone else finds out!